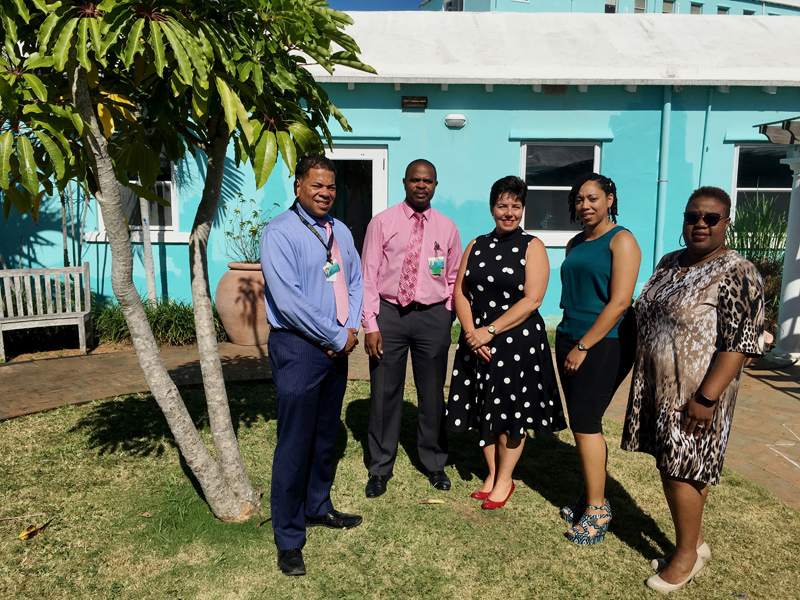 Bermuda Hospitals Charitable Trust and Bermuda Hospitals Board announced an $8,000 donation to develop a therapeutic garden for Child & Adolescent Services [CAS] in its location at the Mid-Atlantic Wellness Institute. Lisa Sheppard, Executive Director at the BHCT adds: “BHCT is very happy to fund the creation of a therapeutic garden for the service users at CAS. We are looking forward to seeing the development of the service to include this type of therapeutic approach. Standing in the area that will be turned into the therapeutic garden, from left to right: R Scott Pearman, Chief Operating Officer, BHB; Preston Swan, Vice President, Clinical Operations; Lisa Sheppard, Executive Director, BHCT; Ashley Simons- Crane , Clinical Assistant, CAS; and Vikita Basden, Social Worker, CAS. Jascinth Albouy-Onyia, Assistant Director Mental Health Services, comments: “This wonderful donation will help us create an intimate space where individuals can be immersed in scents, textures and colours. Dr Carla Bean, Psychologist at CAS, comments: “The sensory features of a therapeutic garden help individuals with natural ‘cues’ to interpret, better use and connect to their environment. Now build it for $250. We already have one in every Parish . eg: Warwick long bay Tobacco bay, Shelly bay, & Mangrove bay. ETC. All this time I thought buss shelters and roads were a priority, simply because we need to enhance our long over due tourist products .